David Shulkin was the first nonveteran to lead the Veterans Affairs Department and an Obama appointee — the lone holdover in the Trump White House. 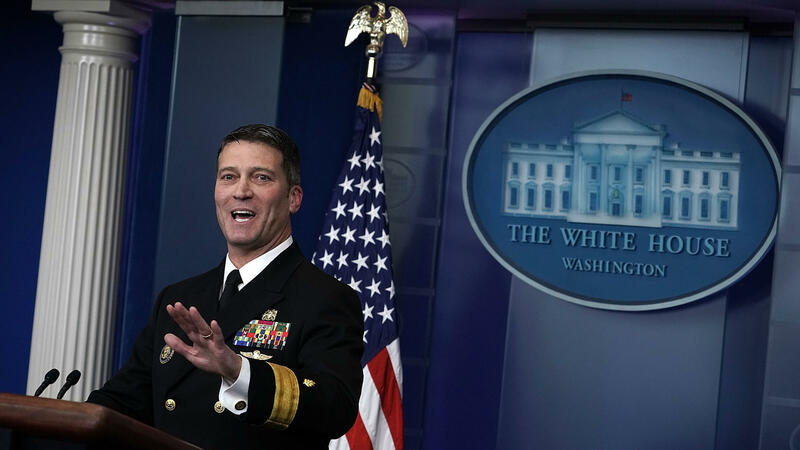 Dr. Ronny Jackson speaks during the daily White House press briefing on January 16, 2018, in Washington, D.C.
"I appreciate the work of Dr. David Shulkin and the many great things we did together at Veterans Affairs, including the VA Accountability Act that he was helpful in getting passed," the president said in an additional statement released by the White House. "He has been a great supporter of veterans across the country and I am grateful for his service." Until Jackson is confirmed by the Senate, Trump said, Robert Wilkie of the Department of Defense will serve as acting secretary of the VA. "Mr. Wilkie is currently the Undersecretary of Defense for Personnel and Readiness at the Department of Defense and overseas health affairs, welfare and quality of life for military families," the president said. Trump said he was "proud" to nominate the White House's top doctor to take over the VA. "Admiral Jackson is highly trained and qualified and as a service member himself, he has seen firsthand the tremendous sacrifice our veterans make and has a deep appreciation for the debt our great country owes them," the president said. Jackson recently presided over Trump's first presidential physical and gave the president a clean bill of health. Jackson has cared for three presidents since joining the White House medical unit in 2006. He was formally named physician to the president in 2013 by then-President Barack Obama. Jackson grew up in West Texas and attended Texas A&M and the University of Texas Medical Branch. He specializes in emergency medicine. According to USA Today, Shulkin said in a statement that Trump "should have a cabinet member that he is comfortable with." "To our nation's Veterans, I want you to know that I will always fight for you no matter where I go. To the dedicated employees of VA, I thank you for your service. I know that you will continue to keep our Veterans at the forefront of everything you do," Shulkin said. House Veterans' Affairs Committee Chairman Phil Roe, R-Tenn., praised Shulkin's tenure, calling him a "friend" who had "done a fantastic job and I hate to see him go." "That said, I respect President Trump's decision, support the president's agenda and remain willing to work with anyone committed to doing the right thing on behalf of our nation's veterans," Roe also said in a statement. "I am in the process of reaching out to Dr. Jackson and I look forward to building a strong relationship with him also." Senate Veterans' Affairs Committee Chairman Johnny Isakson, R-Ga., said Shulkin had "made a tremendous impact toward improving the lives of veterans during his time at the U.S. Department of Veterans Affairs." Sen. Jon Tester, D-Mont., the ranking member on the Senate Veterans' Affairs Committee, said Shulkin had "severed honorably" and now "the VA needs a strong leader at the top who will listen to veterans, strengthen the VA, and work with Congress to implement bipartisan reforms. I look forward to meeting Admiral Jackson soon and seeing if he is up to the job." Sen. Bernie Sanders, I-Vt., a member of the Senate Veterans' Affairs Committee and a former chairman of the panel, warned against any nominee who might support privatization of the VA.
"Every major veterans' organization in this country vigorously opposes the privatization of the VA. I stand with them. Our job is to strengthen the VA in order to provide high-quality care to our veterans, not dismember it," Sanders said. "The Senate Committee on Veterans Affairs should not approve any nominee for secretary who supports the privatization of the VA."
Shulkin had opposed such a move, though some conservatives have championed the idea. It's not known where Jackson stands on the issue. VoteVets, a progressive group, questioned whether Jackson was sufficiently prepared for the job. "Other than a total lack of awareness of where he stands on any issue, we are also concerned that he has never managed an agency like the VA. Now is not the time for people who need training wheels, when it comes to managing a massive health care system," VoteVets director of government relations Will Fischer said in a statement. "While we wouldn't doubt Dr. Jackson's medical credentials, it is essential that he prove that he is intimately aware of how the agency works." Shulkin began his tenure in the Trump administration with a few strikes against him. He was the first nonveteran to lead the department, instead bringing years of experience as a physician and a health care CEO. He was offered the job only after several others turned it down, and he was an Obama appointee — the lone holdover in the Trump White House. That made it all the more unlikely for Shulkin to be so successful — for a time. Known on Capitol Hill as a technocrat brought in to help overhaul the VA in 2015, he coasted to confirmation — 100 to 0 — by the Senate. He hit the ground running, already adept at the labyrinthine VA health network of more than 1,000 hospitals and clinics. With bipartisan agreement on many fixes needed at the VA, Shulkin helped push through an expansion of mental health care, increased suicide prevention and a law making it easier to remove poor-performing officials. For a time, Trump seemed to really like Shulkin, even joking that he would never have to use his reality TV line — "You're fired" — on the secretary. "We'll never have to use those words on our David. We will never use those words on you. That's for sure," Trump said in June. But Shulkin was making enemies among the administration's other political appointees, especially those with connections to Concerned Veterans for America, a lobbying group linked to the conservative Koch brothers. 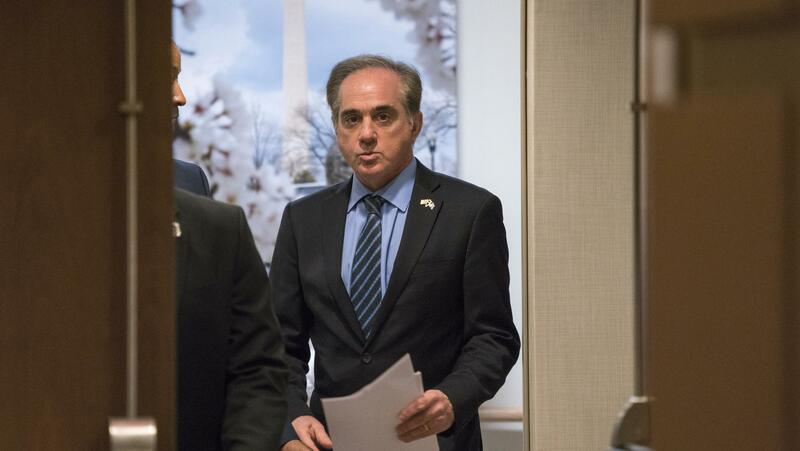 In a December email obtained by The Washington Post, senior VA appointees Jake Leinenkugel and Camilo J. Sandoval openly discussed ousting Shulkin, his chief of staff and his deputy because Shulkin was not aggressively pushing an increased use of private care for veterans. Shortly after the news of Shulkin's impending departure broke, the Concerned Veterans for America's executive director Dan Caldwell said in a statement that while "Shulkin made significant headway in reforming the department," he "ultimately became a distraction from the important task of improving health care for our veterans. We are hopeful that this change will end the recent distractions at the VA and put the focus back on advancing policy that will ensure veterans get the health care and other benefits they have earned." Shulkin gave his opponents an opening in the form of an inspector general's report that harshly criticized his official trip to Europe last spring. The secretary spent 11 days there filling the time in between meetings with several days of tourism. He brought his wife along, paying for her travel with official funds. The IG report also said Shulkin improperly accepted tickets to Wimbledon for him and his wife. The total amount of questionable spending wasn't high by Trump administration standards (see: Ryan Zinke's door or Ben Carson's table), but veterans living on a monthly disability check were not amused, and the trip came shortly after Shulkin had warned VA officials to keep down unnecessary costs. Then his tenure got strange. Headlines openly pondered who was in charge at the VA, and veterans service organizations, which strongly support Shulkin and oppose privatization, started using words like "coup" and circulating lists of officials in the VA who were trying to undermine Trump's VA secretary. That list included Shulkin's top two public affairs officials, who were accused of lobbying Congress to get rid of Shulkin. The secretary apparently lost control of his own public messaging. His own statements were removed from the VA website and his chief of staff abruptly replaced. Shulkin took to his cellphone to directly contact reporters and give his side of the story — even claiming he had the president's support to "purge" what he called "subversion" at the department. Veterans Affairs Secretary David Shulkin is out. President Trump announced his firing tonight on Twitter, and he is nominating the White House physician to replace Shulkin. Quil Lawrence covers veterans affairs for NPR, and he joins us now to talk about this latest shake-up. Hey, Quil. QUIL LAWRENCE, BYLINE: Hello, Ailsa. CHANG: So can you just first remind us? How long has Shulkin been at the VA? And tell us a little bit about what he's done there. LAWRENCE: Sure. So Dr. Shulkin was a holdover from the Obama administration, and he was brought in to help clean up problems at the VA, and he led the Veterans Health Administration for two years. So he was really up to speed on all of the inner workings of health care at VA. Before that, he had managed large health care companies. He's really considered a technocrat - not ideological. Despite all that, he worked very well with the Trump administration, and Trump had seemed to be very happy with him. He even once joked that he was never going to have to use his reality TV slogan on Dr. Shulkin. He would never have to say, you're fired. PRESIDENT DONALD TRUMP: We'll never have to use those words on our David. We will never use those words on you. That's for sure. CHANG: Well, obviously he did use those words, and part of the reason for that may have been a scandal involving the misuse of VA funds. Can you just walk us through the details of that? LAWRENCE: Right. So last year, Dr. Shulkin took what was an official trip to Europe. He combined two official trips and then did a bunch of tourism in between. And he brought his wife along on the trip. Now that was all later deemed by an ethics investigation to be improper, and he paid back the money for this. So it's not a humongous scandal in dollar terms compared to others in the Trump administration. To a veteran living on a disability check, it was still pretty galling. He paid the money back, as I said. There was some criticism in Congress about how he handled that. Not that many in Congress - very few calling for his resignation, and a steady stream of statements of support from Republicans, Democrats and veterans service organizations. CHANG: But that was nowhere near the end of the story for Shulkin at that point, right? LAWRENCE: Exactly. There was a lot of other, much stranger stuff going on. And this is one of those weird instances where the wacky conspiracy theory was actually put in writing in an email between a couple of political appointees within the Trump administration who thought that Shulkin was resisting greater privatization of VA health care. They wanted him to go faster with that. And in this leaked email, they openly discussed using that ethics investigation to push Shulkin and his deputy out. And that set off this very weird situation where since about mid-February, no one was really sure who was in charge at the VA. The public affairs messaging clearly wasn't under Shulkin's control. And as late as this afternoon, people on the Hill and veterans organizations seemed to have no idea this was coming. CHANG: Well, now with his sudden departure, what kind of shape does that leave the incoming VA secretary, White House physician Ronny Jackson? LAWRENCE: Right. And Admiral Jackson is going to have to get up to speed. He's by all accounts a great physician and a veteran who served honorably in combat, a doctor. But understanding the VA health care system is a totally different kettle of fish. The reactions from people in Congress this evening have been to thank Dr. Shulkin for a job well done and say they look forward to meeting Admiral Jackson, but it doesn't look like they know a whole lot about him. Shulkin was confirmed unanimously by the Senate. In this case, we're going to have to see if some members of Congress consider his ouster a victory for privatization, which most of them oppose. They might try to make the confirmation hearing of Admiral Jackson some sort of a referendum on privatization, and that could get very interesting. CHANG: OK. That's NPR's Quil Lawrence. Thank you, Quil. LAWRENCE: Thanks, Ailsa. Transcript provided by NPR, Copyright NPR.